« vStrong.info in 2014: Thank you for your support! 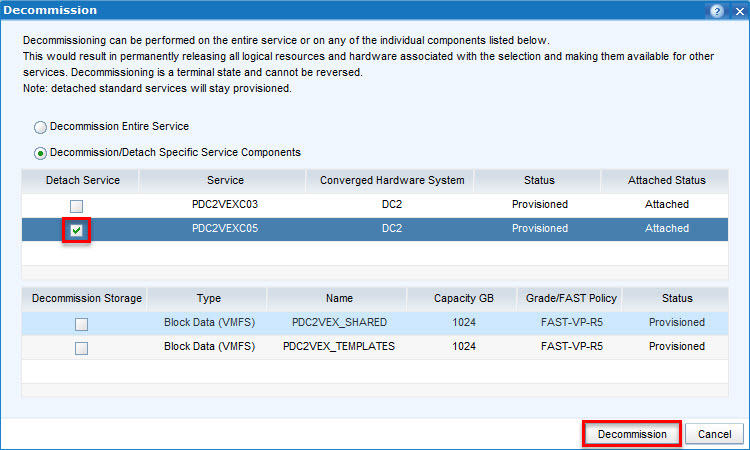 EMC UIM/P Shared Storage Service is the new type of service that allows you to create and share storage between multiple Standard Services. For more in-depth information on the Shared Storage Service please refer to “EMC UIM/P (Nimbus) review” and “UIM/P 4.0 Release” posts. ATTENTION! The initial release of UIM/P 4.0 had a serious bug! When performing a full decommission on a shared storage service, VMs and datastores were deleted from any attached standard services. This bug has been fixed in UIM/P 4.0 Patch 2. Make sure to upgrade UIM/P to the latest version. BTW, this is required for decomissioning of datastores attached to the Standard services as well. Detach will remove the Datastore from Standard Service(s). The SS’ hosts will not be able to see it. The LUN will be removed from the hosts’s Storage Group. This process does not delete the data and, if the datastore is Attached to any other Standard Services, it will still be usable. 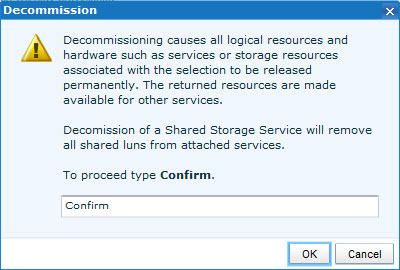 Decommission will remove the shared datastore from Standard Services and delete the LUN. It is not clear if UIM/P is going to Detach or Decomission the datastore! The message is the same for both actions… You may need to go back and double check what option you selected! As you can see, UIM did what we ask it to do… Both datastores have been removed from the cluster hosts. Neither the Shared nor the Templates datastore were deleted. Although this process worked OK, I can see that the lack of clarity of the warning messages and dialog windows may discourage you from using UIM/P to manage Shared Storage. I hope this will be addressed in the future releases.